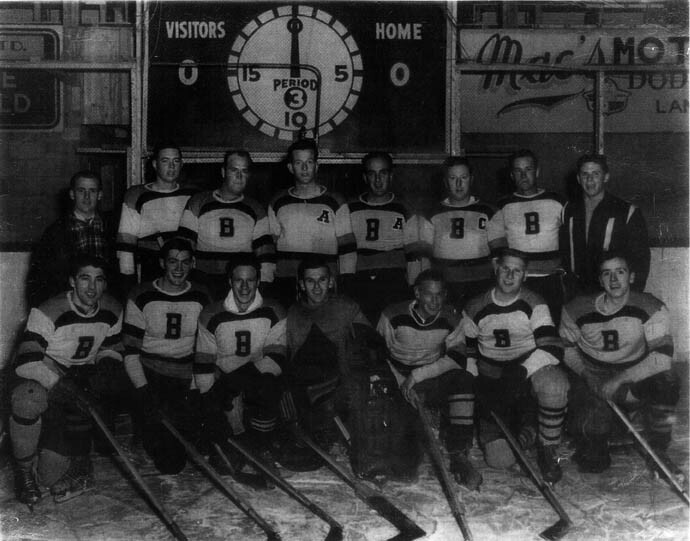 This is a photo of the Bainsville (Blue) Bombers, Circa early 1950's, Bainsville, Ontario. Who are they? Where are they Now? In this photo circa early 1950's in the back row from left to right are as follows, based on knowledge of Rhoda Ross. John Forbes?? if it is, he was killed in a car accident! Not certain may be a ? Baker, Alex thought this Maybe looks like Orville Sinnott?? John McCuaig, brother of Artie MacCuaig, Curry Hill, Ont.